The long days and warm nights of summer never fail to influence my reading selections. Maybe it’s because I can’t live at the beach during the summer (someday we’ll purchase that dream vacation home!) or maybe because it’s so hot in this land-locked state – whatever the reason, during the summer I majorly crave the true escape reading provides. Any character-driven book in a coastal setting pretty much gets my vote every time. Of course, the ideal summer book, while dazzling you and transporting you to the ocean lifestyle, does not simultaneously make you feel guilty for reading poorly written and empty-headed cheese. Unfortunately, I’ve read some beach-read doozies that promised sun and fun but sadly disappointed with predictable plots and stereotypical characters. I think of this type as the cotton candy of summer books, and much like cotton candy, I almost always get that guilty, empty feeling. I definitely prefer some substance with my ocean views and coastal characters. Luckily, J. Courtney Sullivan’s Maine works perfectly as a summer read with some depth and texture. My local Target has been heavily promoting this new bestseller, and thankfully, the novel doesn’t disappoint. Maine affected me not only as a reader but also as a writer – I’d love to be able to create the kind of layered, interesting, and connected characters and plot that Sullivan achieves. Maine features four richly developed narrators – Alice, the matriarch of a large Irish family; Kathleen, her estranged daughter living in California; Ann Marie, Alice’s daughter-in-law and primary care-taker; and Maggie, Kathleen’s daughter and a young writer living in NYC. Each character is going through some kind of crisis or teetering on the brink of some life change, and the conflict will keep you glued to the page (you will definitely suffer from, as my husband likes to call it, the “just one more chapter!” syndrome). The characters separately, on their own turf and in their own lives, are interesting enough, but when Sullivan brings them together at the coastal family home in Maine, the story picks up and the plot connects in a really satisfying way. In Sullivan’s hands, reading about overlapping events from different perspectives continues to be fresh and add more layers to the intertwining story about these complex women that each harbor their own secrets, hurts, and dreams. Sullivan also masterfully weaves historical events into the back story of Alice. I won’t give much away, but in the middle of Maine, you will probably feel the need to do some solid Googling, which truly adds a richness to the book. I also loved how all ages can read and relate to Maine since there are three generations of narrators; this author did a wonderful job capturing the voices and generational struggles of four very different adults. I’ve read Sullivan’s first novel, Commencement, and even though it kept my interest and proved to be really memorable, I would not recommend to everyone. 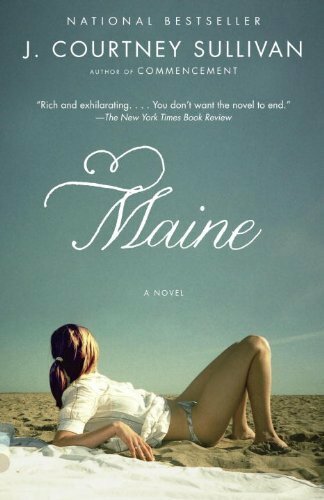 Maine, however, earns my recommendation and deserves its accolades (A Time Best Book of the Year, Washington Post notable book, etc). Ultimately, Sullivan’s novel is perfect for those that love a good character-driven, emotionally layered family saga that happens to take place in a beautiful coastal, summery locale; if that’s you, pick up a copy of Maine to meet and temporarily walk in the shoes of these richly developed, complex, flawed, but ultimately genuine and lasting characters.